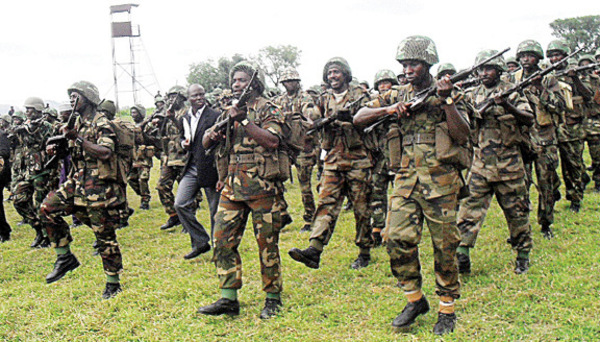 Apparently as a response to the spate of terror attacks perpetrated by militant insurgents, almost daily in the northern part of the country, the Nigerian Army Counterterrorist and Counter-Insurgency (CTCOIN) Centre at the Armed Forces Command and Staff College, Jaji, Kaduna, has trained 439 additional soldiers to be deployed to crisis-prone areas throughout the nation. At the graduating ceremony yesterday, Major-General Kenneth Osuji, the commandant, Nigerian Army School of Infantry urged the graduands to display a high level of professionalism in their duties wherever they are deployed to carry out their anti-terrorism functions. CTCOIN director, Brigadier-General Tijjani Golau, said the soldiers have been able to acquire necessary skills to promptly and effectively tackle the menace of terrorism wherever it rares its head. “On the whole, the graduating participants are eminently qualified and can be deployed to carry out counter-terrorism and counter-insurgency tasks in any part of the country,” he continued. CTCOIN director, some of the course contents undertaken by the soldiers as, manning of roadblocks and checkpoints, identification of Improvised Explosive Devices (IEDs), cordon and search techniques, search and arrest procedures for both gender suspects, unarmed combat, and presentations on dynamics of terrorism and insurgency as they relate to Boko Haram, among others.